expatriate workers who require settling in assistance as well as a work visa or permit. Located in Southern Africa, Botswana is a landlocked country. It borders with Namibia, South Africa, Zimbabwe and Zambia. The bulk of the population of Botswana is in the eastern part of the country. The Southern Region – Tends to be the main point of entry for most visitors and is home to the capital city of Gaborone. Here visitors flock to the nightlife and shopping as its popularity is also due to the number of large diamond fields in the area. The Moremi and Okavango Region – The main city in this region is Maun, which is the primary arrival and departure city in this region. The Okavango Delta is renowned as the world’s largest inland delta and it offers some amazing safari areas. The Chobi region – A must see region for many tourists due to the presence of the Chobe River and the Chobe National Park which houses one of the largest game concentrations on the Africa continent, including a large elephant population. Kgalagadi Region – The Central Kalahari Game Reserve plays home to the world famous Kalahari Game Reserve which straddles Botswana and South Africa. Makgadikgadi and Nxai Pans Region – The Magkadigkadi Salt Pans are the largest salt pans in the world. Gaborone has always been expanding and it is now home to some 300 000 residents. The small dusty administrative town that it was at the country independence in 1966 is now a distant memory. Gabarone is the government capital as well as the economic capital. It is also the headquarters of numerous companies and the Botswana Stock Exchange. Gaborone is also home to the Southern African Development Community (SADC). The population is estimated at 2 million; up from 400,000 in 1950 and increased by 500,000 since 2001. Of this approx 70% are Christians and in excess of 78% are Tswana. 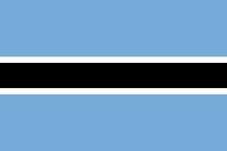 The official language of Botswana is English but over 78% of the population also speak Setswana. Due its location in the middle of Africa and height above sea level there is very little rainfall, making the ‘4 seasons’ hard to distinguish. It normally starts to rain around October or November and the rains may continue through to April. This rain will however be interspersed with long dry spells. The start of ‘winter’ comes around May. This season still offers clear sunny days but nights are cold. August sees spring arrive and temperatures will continue to rise until November / December time. The levels of economic freedom in Botswana are amongst the highest in the region. The aim of diversifying the economy away from diamonds is working and foreign investment is attracted due to a number of incentives including low taxes, political stability, and an educated work force. Botswana is of course endowed with large amounts of natural resources and sets an example to others on the management of these with the lowest levels of corruption in Africa and an independent judiciary. It is the world’s largest producer of diamonds and actively encourages growth of the value add chain in country. Diamond mining accounts for approximately one-third of Botswana’s GDP and 70% of export earnings. Botswana’s economy grew by 8% in 2011. Tourism is on the up and an important industry in Botswana. It accounts for approximately 11% of GDP, and has grown at an annual rate of 14% in the past 8 years. Over half of the population lives in rural areas and are dependent on subsistence crop and livestock farming. Agriculture meets only a small portion of food needs and makes up only 2.3% of GDP–primarily through beef exports. The Botswana currency is the Pula, which means rain in Setswana. Each Pula is made up of 100 thebe (shield). Easily changeable currencies include US dollar, Euros, British Pound and the South African Rand. Most ATM’s will accept foreign visa cards but are located in the larger towns. The more rural areas tend to deal in cash as do many community art and craft outlets. There are a number of airports in Botswana. Some of them are domestic and some are international. The major international airports of Botswana are Gaborone airport and Maun airport. The most practical thing to do is rent a car or buy one. There is public transport but it tends to be between major towns and not to some of the far flung places. The schooling in Botswana remains high up on the government agenda and there are also a number of private schools offering international credentials. You can read more on schooling here. Expats tend to gravitate towards the areas in Gabarone of Broadhurst, Gaborone West, The Village, Naledi and Phakalane. The price of rentals of course varies greatly from 6000 BWP to approx 12,000 BWP. Many expats on long terms contract also buy property with prices starting at around 1,000,000 BWP. There are a number of shopping malls in Botswana, mostly in Gabarone and some of the shops will look very familiar to South Africans such as Game, Spar and Shoprite. There are ample restaurants, pubs and clubs as well as cinemas – in short the evenings can be filled with fun. Whether it is a simple airport pick up through to schooling, housing or settling in services Intergate and its representatives offer a full relocation service which can be tailored to your individual needs or that of your employees. Simply e-mail us here or telephone us + 27 (0) 21 424 2460.